“We face the imperative of making our land produce more. … the needed structural and conceptual changes will have to be introduced,” Raúl Castro famously proclaimed on 26 July 2007, a few days short of a year after provisionally taking over the reins of Cuba’s government from his incapacitated older brother. Nine months later, now formally confirmed in power by the National Assembly, he told a plenary meeting of the Central Committee of the Cuban Communist Party on 28 April 2008 that food production had to be their top concern as a matter of the highest national security. In countries otherwise so very diverse as the United States, Russia and Nigeria, Germany, Iran and the Dominican Republic, Sweden, Brazil and Honduras, the four years that Raúl Castro has de facto presided over Cuba would constitute a full term of office, towards the end of which supporters and opponents of an administration argue over its record during a general election campaign. While Cuba’s one-party regime marches to the beat of a different drummer, its people—like people across the world—respond to the thrice-daily call of their stomachs. Cuba is no exception to the applicability of the time dimension in politics and economics, and the passage of time is a necessary yardstick for judging this government’s effectiveness. So what has the government done in the farm sector in the four years of Raúl Castro’s stewardship? Debts amounting to tens of millions of pesos owed by state agencies to cooperative and independent farmers have been paid. However, the revelation that barely had the old debts been settled when new debts began to accumulate (Varela Pérez, 2009a) undermined claims that the deficiencies which allowed such arrears to arise had been eliminated (cf. Hagelberg and Alvarez, 2007). A reorganization of the agriculture ministry begun in 2007 reportedly resulted in the closure of 83 state enterprises and the transformation of 473 loss-making units, with 7,316 workers transferred to other jobs. Analysis of 17 enterprises selected in a second stage showed the possibility of more than halving the number of employees in management. Overall, the ministry counted some 89,000 “unproductive” workers in the state sector—not including Basic Units of Cooperative Production (UBPCs), undertakings that “after many ups and downs and ambiguities have still not fulfilled the mission for which they were created” (Varela Pérez, 2009b). More recently, agriculture minister Ulises Rosales del Toro3 stated that more than 40,000 “indirect workers” in the sector had to be relocated (Pérez Cabrera, 2010). Shops selling hand tools and supplies for convertible pesos (CUC) have been opened in some municipalities. The degree to which this has created direct access to production inputs has so far been limited by the small number of such outlets and the range of goods on offer. Some fraction of farmer income from produce sold to the state and otherwise is also denominated in CUC. But for the acquisition of larger items and bulk quantities, bank loans in that currency would have to become available (Nova González, 2008). Sharply increased state procurement prices— some, notably for milk and beef, to double and more their former level—have, by all accounts, been an incentive to raise output. But these measures did not amount to structural or conceptual changes, though they could awaken hopes that those would come. No detailed statistics of operations under Decree- Law No. 259 seem to have been published since mid- 2009 (González, 2009; cited in Hagelberg and Alvarez, 2009). The information on land areas by type and tenancy in the most recent yearbook of Cuba’s National Office of Statistics stops at 2007 (ONE, 2010, Table 9.1). Different global figures can be found in media reports. Raúl Castro informed the National Assembly towards the end of 2009 that around 920,000 hectares had been transferred to more than 100,000 beneficiaries, which represented 54% of the total idle area (Granma, 21 December 2009). This would put the magnitude of the total idle area at the outset at 1.7 million hectares. Almost five months later, Marino Murillo Jorge, minister of economy and planning, gave the congress of the Asociación Nacional de Agricultores Pequeños (ANAP), the national association of small farmers, the same figure of 920,000 hectares as the land transferred under Decree-Law No. 259, adding that around half of the areas so assigned remained idle or insufficiently exploited (Granma, 17 May 2010). Let us forget tractors and fuel in this program, even if we had them in sufficient quantities; the concept is to execute it basically with oxen, because it is about small farms, as a growing number of producers are doing with excellent results. I have visited some and could verify that they have transformed the land they are working into true gardens where every inch of ground is used. Raúl Castro entrusted this new initiative specifically to Adolfo Rodríguez Nodals, the head of the National Group of Urban Agriculture (since renamed National Group of Urban and Suburban Agriculture) in the agriculture ministry. The group, he declared, “has obtained outstanding results in urban agriculture, fruit of the exactingness and systematicity expressed in the four controls that it carries out annually in all the provinces and municipalities of the country” (Granma, 3 August 2009). This suggests that Raúl Castro still prized centralized control over operational functionality, evidently unconscious of the fact that it is wholly unsuitable for the management of small-scale mixed farming. While the idea of the Agricultura Suburbana plan may indeed have come from the experience of the Agricultura Urbana program created in the 1990s (Rodríguez Castellón, 2003) and shares some of its policy objectives and features, such as high labor intensity, the two schemes are as distinct as town and country, horticulture and agriculture. Agricultura Urbana rests, in the main, on patios (domestic gardens), plots (empty lots planted to vegetables) and so-called organopónicos—low-walled beds filled with soil and organic matter, with or without drip irrigation, in the open air or in shade houses, their high-tech name derived from hydroponic installations that could not be maintained after the collapse of the Soviet Union. The system, now reportedly embracing around 10,500 organopónicos alone and occupying more than 300,000 workers (Luben Pérez, 2010), no doubt contributes substantially to the food supply and has other advantages. Equally, Rodríguez Nodals’s group undoubtedly fulfills some useful functions by providing advice and facilitating access to supplies in other countries easily available.5 Its face to the wider public, however, consists of tedious reports of its quarterly inspections and the grades it bestows on its charges, rather in the manner of an elementary school teacher (e.g., Varela Pérez, 2010h). In contrast, the basic structural model of Agricultura Suburbana is the finca, a small farm, most often in private hands, located in an eight-kilometer-deep ring between two and ten kilometers from urban centers. The plan is being rolled out in stages stretching over five years, some selected municipalities at a time. Its declared objective is to source the food supply of population concentrations as far as possible from nearby crop and livestock producers primarily reliant on animal power for field work as well as transport. Around the city of Camagüey, the test ground for the project, it is ultimately to comprise some 1,400 units with a total area of roughly 65,000 hectares, 80% of which is agricultural land, the greater part devoted to cattle (Hernández Porto, 2009; Carrobello, 2010; Frank, 2010). Introduced as an experiment in 18 municipalities at the beginning of 2010, the program would be progressively extended to some 600,000 hectares across the whole country, according to ANAP president Orlando Lugo Fonte (Bosch, 2010). The emphasis put on narrowing the distance between producer and purchaser—distributor, processor or final consumer—on employing animals in place of internal combustion engines in field work and haulage, and on using compost instead of inorganic fertilizers shows that the Agricultura Suburbana program, like the government’s other major agricultural policy initiatives in the last 20 years from the creation of the UBPCs to Decree-Law No. 259, is inspired above all by the need to reduce Cuba’s dependence on imports, both food and production inputs, at a time of extreme economic stress.6 To go by the official propaganda, were Agricultura Suburbana enterprises to be characterized by a logo, it would have to feature a pair of oxen. Hence it is disconcerting to find that Cuba’s stock of draught oxen appears to have shrunk by a quarter from 377,100 to 284,700 between 2004 and 2009, in contrast to a growing equine population (ONE, 2010, Tables 9.15 and 9.24). If ONE’s figures are right, the question can reasonably be asked: do the policymakers in Havana know what goes on down on the farm? Regardless of whether it offers a perspective of more than a semi-subsistence agriculture, the shortage of material resources to back up the effort to return swathes of mostly marabú-infested land to production under Decree-Law No. 259 favored the more measured approach of the Agricultura Suburbana program. The authorities were admittedly overwhelmed by the flood of requests for plots triggered by Decree-Law No. 259 (Carrobello and Terrero, 2009a). Within barely more than a month of opening the door to submissions in the autumn of 2008, some 69,000 applications were received—98% of them from individuals and 79% of these from persons without land—according to official figures (Nova González, 2008). Another month or so later and the number of applicants had swelled to some 117,000 (Carrobello and Terrero, 2009a). Was the notorious Cuban dislike for agricultural work another myth? If a fan of the Beatles, Raúl Castro may well have been reminded of the lyrics of Eleanor Rigby: “All the lonely people / Where do they all come from? / All the lonely people / Where do they all belong?” Declaring the distribution of idle land in usufruct one of the great challenges for the coming year, he rather optimistically told an interviewer on the last day of 2008: “We have already put behind us the first, initial obstacles we encountered because of atavistic bureaucratic habits” (González Pérez, 2009). In fact, many successful applicants found that what they had signed up for was, as the trade union organ Trabajadores recalled later, hacer de tripas, corazón (summon up the guts to root out the marabú), “most often without the necessary tools and without a gram of herbicide, by sheer spirit alone” (Rey Veitia et al, 2010). An investigation by a team of Juventud Rebelde reporters in March 2009 unearthed multiple problems—lack of hand tools, machinery and fuel, insufficient financial support, uncertainty over whether even a shelter was permitted on the plot, shortage of fencing wire, and bureaucracy—along with concern over the technical unpreparedness of people new to farming (Pérez et al, 2009). In rebuttal of purported exploitation of the issues by foreign news agencies allegedly intent on defaming Cuba, Trabajadores sought to dampen down expectations: “It would be a delusion to think … that any agricultural process that begins with the request for the land could bring significant productive results in only nine months…. Bureaucracy? Yes, it is a process that implies steps and involves various agencies” (González, 2009). For some time I have been supplying eggs to a school in the community. Until now I have done it with the hens I have, but they have to be replaced because they are getting old and don’t produce. When I asked for replacements, there was so much paperwork that I am still thinking about it. Hagelberg and Alvarez (2009) underlined the scope for statistical manipulation offered by a metric of land utilization that allows inclusion of areas merely earmarked for a crop, as officially employed in Cuba in respect of sugarcane. Carrobello and Terrero (2009a) subsequently pointed to another possibility—there may have been no second study, merely a reclassification of categories that moved the goalposts: “But if we add [to the figure of 1,232,800 hectares] the pastures of doubtful utility, 55% of the agricultural area was not cultivated.” Agricultural statistics everywhere must, by the nature of things, be granted a margin of error and should not be interpreted too closely. But this is a discrepancy of a different order. In a matter as sensitive as idle land, pollution of the statistical process by political or ideological considerations cannot be excluded. A century- old practice of maintaining grassland reserves in sugar plantations to expand the cane area when profitable to do so moreover conjures up an image of turf wars between the agriculture and sugar ministries. However, ONE publications also contain numerous infelicities hard to ascribe to political contamination. For instance, the most recent ONE statistical yearbooks (ONE, 2009 and 2010) report tonnages of sugarcane processed in each season since 2002/03 (Table 11.3) greater than those produced for delivery to the mills in the respective season (Table 9.4). Though perhaps not on a par with the biblical miracle of the loaves and fishes, the magnification amounts to as much as 900,000 metric tons in 2002/ 03 (4.1%) and 800,000 tons in 2006/07 (6.7%). Examination of earlier editions of the yearbook indicates that this inconsistency began in 2002/03, the first crop following the restructuring of the industry. The technical indicators displayed in Table 11.3— cane milled, sugar produced, yield and polarization—are a farrago of incongruities and plain error. Unusually, ONE references these solecisms to the sugar ministry, but that does not absolve it of responsibility since it is the controller of the national system of statistics and guarantor of their quality. The question-mark hanging over ONE’s integrity, competence and professionalism notwithstanding, it is for outside analysts the only source of the data necessary to present more than an anecdotal picture of Cuban agricultural performance. Accurately weighing the impact of the three major hurricanes and a tropical storm that occurred in 2008—described as the most destructive hurricane season in Cuba’s recorded history (Messina, 2009)—both on that year’s output and regarding after-effects, is an additional problem. Messina noted miscellaneous reports of damage and losses in tree and arable crops, chicken and egg production, and sugar factories. But the expected high levels of loss were not reflected in the official data. Discussing the possible reasons for the lighter than anticipated losses recorded, Messina thought the most plausible explanation was that particularly in perennial and tree crops the greater part of the harvest takes place in spring and was largely completed before the hurricane season. The full impact of the 2008 weather events would therefore not become apparent until the spring harvest of 2009 and would have to be taken into account in looking at that year’s figures. 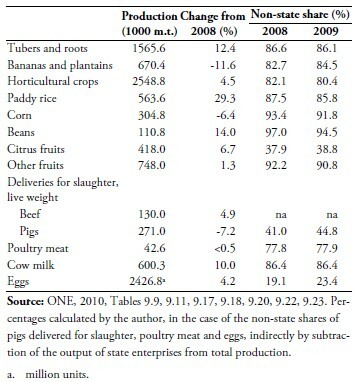 Table 1 summarizes the official data on 2009 performance in the major crop and livestock categories. The information for the non-state sector is said to comprehend Basic Units of Cooperative Production (UBPCs), Agricultural Production Cooperatives (CPAs), Credits and Services Cooperatives (CCSs), as well as dispersed private producers and estimates for house patios and plots (ONE, 2010, Chapter 9, Introduction). No breakdown into its components is provided in the yearbook. Given the hybrid character of the UBPCs (Hagelberg and Alvarez, 2009), their assignment to the non-state sector is debatable. Interestingly, they are carried on a separate government register from CPAs and CCSs (ONE, 2010, Chapter 4, “Institutional Organization,” Methodological Notes). The estimates for patios and plots may also include self-provisioning patches of state enterprises, UBPCs and CPAs; but it is reasonable to suppose that the majority are in private hands. In any event, it is understandably difficult to capture the full volume of production in this category (Messina, 2009). With the sole exception of rice, recorded 2009 outputs in the major crop lines listed in Table 1 were below—in some cases, far below—their levels in 2004, the first year shown in this edition of the yearbook. Average yields per hectare (ONE, 2010, Table 9.12) were the lowest for the six-year period 2004– 2009—except citrus fruits, in fourth place from the best, higher than expected, and other fruits, in fifth place. The record is better in livestock products, with only poultry meat not reaching the 2004 figure. Except in egg and poultry meat production (ONE, 2010, Tables 9.22 and 9.23), there are also clear signs of improved efficiency, with average beef and pig live weights at slaughter and milk yield per cow on rising trends, although still at very low levels (ONE, 2010, Tables 9.17, 9.18 and 9.20). Not so much legacy effects of the 2008 weather as badly distributed and overall low rainfall the following year (ONE, 2010, Table 2.3) was probably at least in part responsible for lackluster 2009 crop yields, alongside of more secular factors. Messina (2009) surmised that citrus output may still be affected by the bacterial citrus greening or Huanglongbing disease, a conjecture confirmed by Varela Pérez (2010c). Growing corn in Cuba is constrained by low yields and high production costs. Some of the output swings in either direction are easily traceable to official actions on prices and resource allocation. Potato producers enjoyed priority in the supply of imported seed, fertilizer and plant chemicals. Rice and beans are focal points of the policy of import substitution. Milk production mirrors the effect of price incentives and the increase in small-scale stock farming as a result of Decree-Law No. 259, among other factors. On the other hand, the drop in the delivery of pigs for slaughter suggests a classic hog cycle farmer response of herd reduction after encountering marketing difficulties in 2008. Unsurprisingly in an agriculture as exposed as Cuba’s to governmental intervention as well as the vagaries of the weather, there is scant evidence of stabilization in domestic food production. A greatly expanded area planted was the principal factor behind a comparatively large tomato harvest, the main contributor to the smallish rise in the horticultural crop total. Memories of losses due to the inability of Acopio, the state procurement agency, and of processing plants to handle last year’s tomato crop are likely to be reflected in 2010, if the large decreases in area planted and production in the first quarter, compared with the same period in 2009 (ONE, Dirección de Agropecuario, 2010) are a guide. Compared with the same period in 2009, the first three months of 2010 saw bananas and plantains up 75.1%, but tubers and roots down 9.0%; horticultural crops down 25.1%; corn up 4.9%; beans down 30.5%; paddy rice up 45.5%; citrus fruits down 21.7%; other fruits up 16.1%; live weight beef and pig deliveries for slaughter down 3.2% and 3.3% respectively; cow milk down 6.0%; and eggs down 1.1% (ONE, Dirección de Agropecuario, 2010). Unless the 2010 rainy season breaks the severe drought that began in late 2008, the government could easily find itself again between the Scylla and Charybdis of a national food crisis or a huge food import bill. If there is a clear message from the data, it is Cuba’s dependence on the non-state sector—and to a greatly increased extent on the truly private part thereof— for the national food supply. The gradual 245,000– hectare (25%) expansion of the agricultural land owned or leased by private operators that took place between 1989 and 2007 (Hagelberg and Alvarez, 2009) was dwarfed by the structural change in land tenancy within the space of a few months by the implementation of Decree-Law No. 259. This is too recent a development to have made an impact on the non-state shares in output shown in Table 1, most of which were already of a high order. However, it is reflected in the non-state shares in crop areas harvested and in production—in seven out of eight categories higher in 2009 than in 2008 (Table 2). Overall, the total area harvested and in production of the crops listed here grew by 293,353 hectares from 1,047,559 hectares in 2008 to 1,340,912 hectares in 2009 (ONE, 2010, Table 9.6), an increase of 28.0%. The expansion of the non-state share was greater, both absolutely and relatively, amounting to 296,571 hectares from 906,981 hectares in 2008 to 1,203,552 hectares (ONE, 2010, Table 9.8)—an increase of 32.7%. Indicative of the impaired state of Cuba’s agriculture, however, is that while the 2009 areas of all these crops exceeded the previous year’s, those of bananas and plantains, horticultural crops and citrus fruits had yet to recover their 2004 level. The total 2009 area of 1,340,912 hectares exceeded the corresponding figure for 2004 by just 114,279 hectares, or 9.3%. Another measure of the enhanced role of the nonstate sector—in this case excluding UBPC affiliates who are considered ineligible to belong to it—is the growth of the organization representing private farmers, although there is a confusion of numbers. Towards the end of 2009, a member of the national bureau of the Asociación Nacional de Agricultores Pequeños reported that nearly 57,000 new producers had joined the organization and that a further 3,000 new entrants were expected, with an equal growth in the membership of credits and services cooperatives (Carrobello and Terrero, 2009b). The figure of some 60,000 new farmers was subsequently confirmed by Orlando Lugo Fonte, ANAP’s president (Hernández, 2010). But Lugo Fonte has also reportedly said that the small farmer sector had grown by “more than 100,000 new members” as a result of the transfer of idle lands under Decree-Law No. 259 (“Destacan potencial . . ., ” 2010; Fernández, 2010). However, on the eve of the 2010 ANAP congress he spoke of 362,440 members in CPAs and CSSs, organized in 3,635 base units (Varela Pérez, 2010g). This figure would be roughly consistent with the addition of 40,000 new members to the 327,380 reported in 2005, which was the influx Lugo Fonte had initially expected in 2009 to result from Decree-Law No. 259 (Hagelberg and Alvarez, 2009).8 While a large fraction of the new producers undoubtedly had previous farming experience as agricultural laborers or technicians—the personnel made redundant by the downsizing of the sugar industry alone constituting a big pool, the fact that the bulk of the applicants for land under Decree-Law No. 259 were previously landless led Armando Nova, an academic and member of the Centro de Estudios de la Economía Cubana, to speculate on “the beginning of a process of ‘repeasantization’” (Carrobello and Terrero, 2009b). Recognition at the apex of Cuba’s leadership that Decree-Law No. 259 had created new economic and social “facts on the ground,” with political implications to be closely watched, would explain the participation of first vice president and Politburo member José Ramón Machado Ventura in ANAP regional meetings in preparation for the association’s tenth congress in the spring of 2010. In a conspicuous display of political manpower, agriculture minister Ulises Rosales del Toro, Politburo member and a vice president of the council of ministers, and ANAP president Lugo Fonte, member of the Communist Party’s central committee and of the council of state, were regularly outranked at the presiding table of these gatherings by the No. 2 in the national hierarchy. In his speech to the National Assembly in July 2008, Raúl Castro himself returned to his oft-quoted 1994 statement, near the nadir of Cuba’s fortunes following the collapse of central and east European communism, that “beans are more important than cannons.” Previously, in April, his focus on food production together with the announcement that the long overdue sixth Communist Party congress would be held towards the end of 2009 had ensured that the subject would continue to figure prominently in the debates about Cuba’s future that the regime had organized throughout the country. As it turned out, the congress was again postponed in July 2009 and the prospect then offered of a party conference has also still to materialize. But whatever the authorities gained from the debates in gauging the popular mood, identifying hot spots, preparing the citizenry for cuts in public services and state jobs, and providing a safety valve for discontent, there is one visible result: the greatly increased reflection in the mass media of the raw reality that people have long talked about in the street. Time showed that, not having been recognized as true cooperatives, many remained halfway between the state farm and the CPA [collective farm composed of former private holdings]. [Their members] were neither cooperativists nor wholly agricultural workers; a limbo was created, but moreover factors deforming their essence arose, to the point of maintaining intact the structure of the original enterprises, to the control of which they were subordinated. In a subsequent article, Varela Pérez (2010b) listed the differences between genuine cooperatives and the UBPCs that had worked to the latter’s detriment. But the new realism goes only so far. The UBPCs failed, with few exceptions, because “they strayed from the essential principles approved by the Politburo … the approved basic principles were forgotten” and because of “the violation of the concepts that brought the UBPCs to life.” Yet it was the regime’s penchant for centralized decision-making and micromanagement that dominated in the creation of the UBPCs in 1993.9 “We are so accustomed to disguise ourselves to others that in the end we become disguised to ourselves,” La Rochefoucauld wrote long ago. As long as this is the case, the new openness cannot progress from description of symptoms to diagnosis of causes and thought-through response. Recognition that beans are more important than cannons has not so far led the government to more than tinker with two major issues that weigh on the overall performance of Cuba’s agriculture: the debacle of the sugar agroindustry and the flawed system of state controls over farm inputs and outputs. For the sixth year running—and, ironically, when world market prices reached their highest point since 1981—Cuba has produced less than 1.5 million metric tons of sugar in 2009/10, a fall of more than 80% from the average annual output of the 1980s. In the last days of the harvest, Reuters (3 June) put the final figure at 1.1–1.2 million metric tons. In early May, a note from the council of state announced a change of sugar ministers, the outgoing having asked to be relieved of his responsibilities “on recognizing the deficiencies of his work which were pointed out to him” (Granma, 4 May 2010). An agronomic engineer, he had been promoted from first vice minister less than 18 months before, after a 38– year career in the sugar sector. His replacement, a chemical engineer, has similarly risen from first vice minister, after more than 30 years in the sugar sector. The new incumbent will not be a minister for long, however, if the knowledgeable Reuters and Financial Times correspondent in Cuba, Marc Frank, was right that the sugar ministry would soon be transmuted into a corporation (Reuters, 7 April 2010). The day after this announcement, Varela Pérez (2010f) blamed what he called the poorest sugar crop since 1905 on bad organization, overestimates of the available cane, and “a high grade of imprecisions and voluntarism.” But if this had to be the main tenor of a story put out to explain the defenestration of the minister,10 disclosure that 55% of the crop area had not been fertilized, only 3% irrigated (down from up to 30% in the 1980s) and that sugarcane was “today the lowest paid [product] in agriculture” rendered implausible the pretense that “disciplinary measures” and “perfecting the system of administration” were all the answer required. In calling for the restoration of sugarcane to the place corresponding to its continued significance economically and as “part of Cuba’s patrimony,” Varela Pérez either forgot or hoped his readers will have forgotten Fidel Castro’s denunciation in 2005 of sugar as the “ruin” of Cuba’s economy and belonging to “the era of slavery” that was the cue to reduce the industry to its present penury. With the 2009/10 harvest having starkly demonstrated “the effects of the cane crisis” to the point where continued decline could end in the industry’s extinction, there was an echo of the old Cuban saying, Sin azúcar, no hay país (without sugar, there is no country), in the way Varela Pérez (2010i) posed the question how to begin restoring sugar’s “noble and economic tradition” that “has distinguished Cubans historically.”11 The repeated emphasis on the unremunerative cane price—responsibility of the ministry of finance and prices—suggests that the Cuban regime is not exempt from the inter-departmental differences regularly seen in other governments. The other big issue—the state’s control over what goes into and comes out of agriculture—lies at the heart of the Cuba’s command economy, which explains the regime’s reluctance to tackle it in a fundamental way despite the record of its vices stretching over decades. In what is until now the most recent attempt to make the system more efficient, the distribution and marketing functions of Acopio in Havana city and province passed from the Ministry of Agriculture to the Ministry of Domestic Commerce (MINCIN) in August 2009. But within barely more than a month, it was clear that MINCIN “was not sufficiently prepared for the task,” with the result of “significant losses” of perishable products (Varela Pérez and de la Hoz, 2009a). Anxious to find some progress, Granma’s reporters returned to the scene again and again (Varela Pérez and de la Hoz, 2009b, 2009c, 2009d), faith triumphing over experience: “However many difficulties, the socialist market has to be a mission possible,” they wrote. It remained just a hope. In the first two months of 2010, the state food markets in the capital received only 62% of the supplies they were supposed to get from the farmers in the province. Among the reasons: growers had been left without the fertilizer and plant protection chemicals they needed in the last quarter of 2009, and MINCIN still had not got its act together. Bizarrely, a regulation prohibited trucks carrying produce from other provinces to enter the city, even with the proper documentation, and with MINCIN company buyers no longer picking up various kinds of horticultural produce, Havana province farmers were reducing plantings (Varela Pérez, 2010d). Across the island, apparatchik interference with supply and demand has at different times and in different places thrown a variety of spanners into the works. Farmers who have heeded government calls to produce more have pitched up against a worn-out infrastructure. In Granma province, an unspecified amount of rice was lost, some was processed below quality, and growers still held 1,000 tons dried manually owing to insufficient industrial drying, milling and storage capacity, and these were not the only problems (Sariol Sosa, 2009). In a Villa Clara municipality, the government got itself into a tangle with farmers who, urged to plant a greater area of garlic than contemplated, produced about double the crop it had contracted to buy (Pérez Cabrera, 2009). In Camagüey, the state lactic products company was not ready to cope with the increased volume of milk deliveries, and the milk spent, on average, four and a half hours on the road between producer and processor, to the detriment of its quality (Febles Hernández, 2009). Mangoes similarly overwhelmed the infrastructure in Santiago de Cuba (Riquenes Cutiño, 2009). 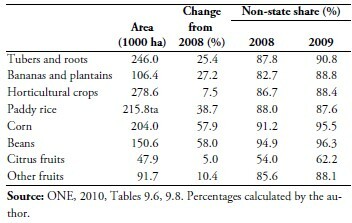 A cross-country survey of the non-citrus fruit situation (Carrobello and de Jesús, 2010) found some improvements, notably the appearance of roadside sales points and ambulant vendors; but production and distribution continued to be hampered by lack of irrigation facilities, input shortages ranging from fertilizer and plant chemicals to gloves and boxes, difficulties in obtaining bank credits, and the rigidities of the state procurement apparatus. Yet though he grumbled about various deficiencies and incongruities, ANAP’s Lugo Fonte still thought that the cure lay in rigorous contracting between parties and was not prepared to identify the monopsonistic and monopolistic position of state enterprises in relation to the farmer as the root of the problem (Barreras Ferrán, 2010). A whiff of oligarchal factionalism came from a Lugo Fonte interview in which he recounted the conditions that had depressed cattle farming in the private sector. Small farmers had been allowed to sell their animals only to state companies, most of which did not have scales and bought the cattle “on the hoof,” based on the color of the hide, the tail and the horns, and with a high charge for slaughtering—all in accordance with regulations. These rules had been dumped and beef prices sharply raised. But, in order to preserve their margin, the companies were now hindering producers from sending animals directly to the abattoir by refusing to rent vehicles (Varela Pérez, 2010a). And while ANAP members were being encouraged to send raw milk straight to retail outlets, Lugo Fonte lamented that this practice had not been extended to other products, such as eggs (Varela Pérez, 2010g). If Acopio was provoking “downpours” of criticism, the mechanisms of supplying farmers with inputs were causing a “tempest,” Juventud Rebelde, the Communist Party’s youth organ, reported on the weekend of the ANAP congress (Varios Autores, 2010). More was to come at the congress itself. Entitled “For greater farm and forestry production,” much of the 37–point report of its commission on production and the economy was given over to a somewhat unselective survey of the gamut of products, from rice to medicinal plants, and from beef to honey, in which greater output could replace imports and enhance exports (Granma, 17 May 2010). But coupled with this were demands on government to resolve a host of functional issues: credit provision; water usage approval; allowing producers to sell directly to retailers, tourist facilities and slaughterhouses; promoting local micro and mini-industries; seasonal price differentiation; crop insurance; tax reform; access to building materials; freeing the cooperatives from restrictions and empowering them to enter into contracts; and reforming quality norms. Of sufficient importance to deserve a point by themselves were the “innumerable concerns” raised by the delegates from Havana city and province concerning the system of commercialization piloted in these territories—excessive product handling, crop losses, arguments over quality, retail outlet permits, state company margins, cartage, container return, and trucks owned by cooperatives being barred from delivering straight to the city’s state markets. Concerning market reform, Murillo Jorge had but one announcement—the government would “organize the creation in the majority of the municipalities of the country of an input market where producers could acquire directly the resources necessary for crop and livestock production, replacing the current mechanism of central allocation.” The price policy governing this market, he spelled out, “must guarantee, on the one hand, recognition in the acopio price [the price at which the state acquires products] of the real costs of production and, on the other, the elimination of the great number of subsidies that the state pays today through the budget.” Whether this market will amount to something more than adding to the small number of existing stores selling tools and supplies for convertible pesos and how it will obtain its merchandise, if not by central allocation, was left in the dark. All together, it is hard to resist the impression that this was a holding operation at which ANAP delegates could let off steam, but from which they emerged none the wiser about key government policy areas that affect the private farm sector. A number of subjects, Murillo Jorge said, were “in process of analysis and study within the context of the updating the Cuban economic model,” naming taxation (of both farmers and their workers), the contracting of outside labor (stating that more than 100,000 wage workers were employed by cooperatives), and the prices of inputs and of acopio. Speaking to the congress of the Communist Party’s youth organization in April 2010 (Granma, 5 April), Raúl Castro acknowledged the existence of voices urging a faster pace of change. Whether the regime’s tempo is dictated by the magnitude and complexity of the problems facing Cuba, as he claimed, by divisions among the leadership, by lack of the cash needed to jump-start major reforms, by incompetence, or by all these, is an unknown—certainly to outsiders. Specifically in the area of farm policy, the twists and turns over half a century invite the question: do the policymakers really understand agriculture and how it develops? When it comes to the effective application of scientific and technological advances— highlighted by Murillo Jorge as “an aspect that requires the greatest immediate attention,” for instance, are Cuba’s policymakers sufficiently versed in the agricultural history of other countries to appreciate the interactions of market forces, farmer-boffins, equipment manufacturers, chemical companies, plant breeders and agribusinesses, alongside of public institutions such as experiment stations and extension services, that drive innovation? Although located, broadly speaking, towards the opposite end of the spectrum from the extensive model of agroindustry growth that hit the buffers in the second half of the 1980s, before the fall of the Berlin Wall, the concept now being promoted is similarly extensive in several respects. In pursuit of the goals of replacing imports and increasing exports of agricultural products, the government campaigns to substitute human muscle and animal power for engines, compost for inorganic fertilizers, home-grown animal feedstuffs for concentrates, and prioritizes the expansion of land under cultivation over raising yields. Comprehensible, up to a point, as fire-fighting in the midsts of current economic and financial woes, can these methods generate a serious improvement in Cuba’s agricultural trade balance? While the application of idle land and labor will surely increase the domestic food supply, can it make the country anywhere near self-sufficient? Is this model viable in the longer run? Disturbingly, in all the hype in favor of using oxen for field work and transport, there is nary an indication that either the costs of breeding, rearing, training, feeding and apparelling the animals, or the productivity of a team, including its driver, taking into account speed of locomotion and length of working day, have been factored in. Likewise missing from the hymns to the benefits of compost are signs of awareness that to make enough compost for general application entails industrial-scale production techniques with specialized equipment. To project the picture of a new mentality gestating in the countryside, Juventud Rebelde located, for its edition on the weekend of the ANAP congress, a few young farmers earning several times the average national wage (Varios Autores, 2010). “In my case,” said one, “when I get the money together, I’ll buy myself a cellphone, because I need it; tell me about it, as, like other presidents of cooperatives, I don’t have anything with which to communicate.” Twenty-first century aspirations in Cuba, as elsewhere. For his part, Raúl Castro—spookily bringing to mind Churchillian rhetoric12—proclaimed before the National Assembly on 1 August 2009: “They didn’t elect me president to restore capitalism in Cuba or to surrender the Revolution. I was elected to defend, maintain and continue perfecting socialism, not to destroy it.” For that, he realized, beans are more important than cannons. Does he understand that they are more important than command and control? 1. I am grateful to Brian H. Pollitt as well as to José Alvarez, Marc Frank, William A. Messina, Jr., and Jorge F. Pérez-López for useful comments on earlier drafts but am solely responsible for remaining shortcomings. 2. Raúl Castro inherited a stagnant farm sector. After rising by 3.6% in 2003, crop and livestock agriculture and forestry GDP (at constant 1997 market prices) successively fell by 0.2%, 12.4% and 7.5% in the next three years. Growth of 19.6% in 2007, 0.6% in 2008, and 3.3% in 2009 just about restored it to its previous level (ONE, 2009 and 2010, Table 5.8). Short of hard currency, the government slashed food and live animal imports by almost a third from 2.2 billion pesos in 2008 to 1.5 billion pesos in 2009, slightly below the 2007 level (ONE, 2010, Table 8.11). But roughly the same quantity of milk powder, for instance, cost 22% more in 2009 than it had in 2007, and 4% more money bought nearly 13% less rice (ONE, 2010, Table 8.13). 3. Rosales del Toro was subsequently replaced as head of the agriculture ministry by its first vice minister and put in overall charge of the agriculture, sugar and food industry ministries (Granma, 12 June 2010), a move that possibly presages a merger of these bodies. 4. For the text of Decree-Law No. 259 of 10 July 2008 and of the implementing regulations, Decree No. 282 of 27 August 2008, see Granma, 18 July 2008, and Gaceta Oficial No. 30 Extraordinaria, 29 August 2008, respectively. The provisions are summarized in Hagelberg and Alvarez (2009). As noted there, already prior to this legislation, the agricultural land owned or leased by private farmers had grown by 25% from 970,000 hectares to some 1.2 million hectares between 1989 and 2007, according to official statistics, with the cultivated land in that sector increasing by more than 50% from 520,000 hectares to 800,000 hectares. Subject to certain conditions, Ministry of Agriculture Resolution No. 223/95, dated 29 June 1995, authorized grants of up to one caballería (13.42 hectares) of idle state land in indefinite usufruct to small farmers having sufficient family labour and equipment to exploit the land (http:// faolex.fao.org/docs/pdf/cub4795.pdf). 5. The writer, residing in a small English city, gets the seeds, with instructions how to plant on the packets, for his little vegetable garden from a nearby supermarket. 6. The expenditure on inorganic fertilizer imports was reduced by two-thirds from 171.3 million pesos in 2008 to 55.7 million pesos in 2009 (ONE, 2010, Table 8.13). Urea, the main item in quantitative terms in 2009, was probably used at least in part as an animal feed additive. Imports of herbicides, pesticides and plant growth regulators were also cut, but relatively less. 7. To put this in perspective, the 1.7 million hectares of idle land exceeded by 350,000 hectares the sugarcane area harvested in 1988/ 89 for a crop of more than 8 million metric tons of sugar. 8. The official employment statistics (ONE, 2010, Tables 7.2 and 7.3) do not clarify the issue. The total number occupied in agriculture, hunting, forestry and fishing—not broken down—reportedly rose by 26,500 from 919,100 in 2008 to 945,600 in 2009, but was still below 2004–06 levels. However, the number of cooperativists—UBPC and CPA members—fell by 2,200 from 233,800 to 231,600. Total private sector employment is put at 602,100 in 2008 and 591,300 in 2009, a drop of 10,800, while the number of self employed workers, included in this category, increased by 2,200 from 141,600 to 143,800. Excluding these, presumably mostly urban, self-employed workers, private sector employment—under which heading come small independent farmers—thus appears to have shrunk by 13,000 from 460,500 in 2008 to 447,500 in 2009. Possibly, a high loss rate by retirement and death among farmers, given their advanced average age, more than offset the number of new entrants. 9. Decree-Law No. 142 of 20 September 1993 placed the UBPCs “within the present enterprise structures of the ministries of sugar and agriculture” (Article 1) and prescribed that while “they will be owners of the production” (Article 2b), “they will sell their production to the State through the enterprise or in the form the latter decides” (Article 2c). For a list of critical papers—almost all from authors on the island and affiliated with Cuban institutions—see Hagelberg and Alvarez (2006). 10. The council of state’s action itself was not mentioned in an article of more than 1,000 words bearing all the earmarks of having been officially briefed. The dismissal of the minister also went unnoticed in the 714–word review of the 2009/10 sugar crop disaster by another prominent journalist who, in addition to a price policy that made sugarcane uncompetitive with other crops, pointed to the handicap of a system of centralized allocation of hard currency financing, said to have been only recently made more flexible (Terrero, 2010). 11. We have been here before. The regime’s love-hate relationship with sugar began 50 years ago with the demolition of 10,000 caballerías (134,000 hectares) of cane, followed not long after by a plan to produce 10 million tons of sugar in 1970 (Hagelberg and Alvarez, 2006). 12. Winston Churchill: “I have not become the King’s First Minister in order to preside over the liquidation of the British Empire.” Speech at Lord Mayor’s Luncheon, Mansion House, London, 10 November 1942.